Our African safari dining experience includes most of the restaurants in Southern Africa's national parks & game reserves and some of the private lodges in Sabi Sands as well as some of the east african lodges. The food has been excellent in some instances but average to poor in most. 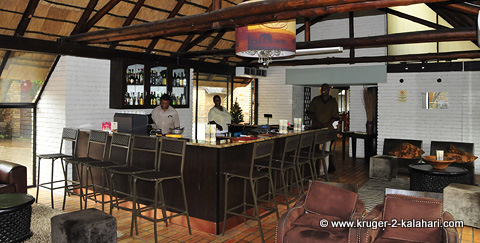 When we first started visiting the Kruger Park we ate only at the restaurants - we did not braai (barbeque) at all. 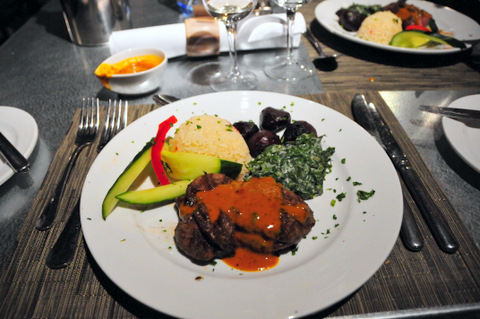 The food and service were generally good but the restaurants had no views and were old and tired in terms of decor but the menus and our safari dining experiences were good. SANParks then, in 2001, outsourced the restaurants to Nature's Group who went insolvent in 2005 - prices went up and quality went down so it was no surprise to us! The restaurants were then outsourced to Compass Group in 2005/2006. The restaurants were refurbished and looked very nice. Some were extended (like Olifants and Skukuza) and some have been relocated (like Lower Sabie) in order to provide views across the Sabie and Olifants rivers. The main camps all have restaurants and 'quick-service' restaurants or Deli's (take-aways or sit under umbrellas). That, however, is where the improvements end - the food and service still leave much to be desired! 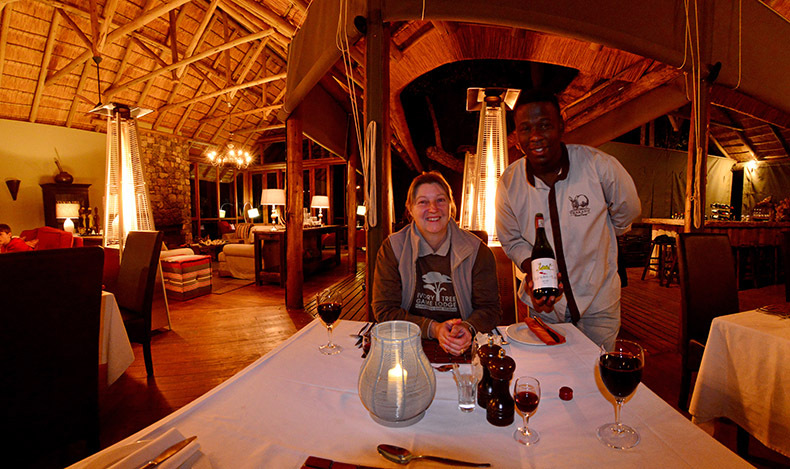 We have had the odd experience of 4-star safari dining (food and service) yet when we returned to the same restaurant a day or two later we got 1-star food and service - very unpredictable! It was only a matter of time before Compass got kicked out due to the many complaints and in 2014 the restaurants were outsourced for a third time to Mugg & Bean, Wimpy, Tindlovu and Cattle Baron. Initially the food and service were good but then guess what - yip - the prices went up and the service and food quality generally went down. In particular the Mugg & Bean at Letaba, Satara and Olifants have been plagued with strikes on top of the bad food and service complaints, so in March 2017 Mugg & Bean gave the franchisee notice meaning that he has to take down their signage and operate independently. He couldn't get it right with the backing of a big franchise group so how's he going to get it right going alone? The service at Wimpy in Pretoriouskop camp is not good - we sometimes have to wait 40-50 minutes for an order and the decor isn't appropriate for the bush - they could have put more effort into the design! The food and service at Cattle Baron in Skukuza is very good - we have had a few bad meals with lousy service but generally we enjoy eating there. Tindlovu, which runs the restaurants at Berg en Dal, Mopani, Punda Maria and Shingwedzi camps seems to be the group with the least complaints. They also run Afsaal picnic site that provides very good food and service. Tindlovu are the ones that are called in to operate an emergency kitchen when the staff at Mugg & Bean Satara, Olifants and Letaba are on strike. Our opinion of Tindlovu: the food and service at Shigwedzi camp leaves much to be desired but at Mopani, Punda Maria and Berg en Dal both food and service are generally good, but very good at Afsaal picnic site. 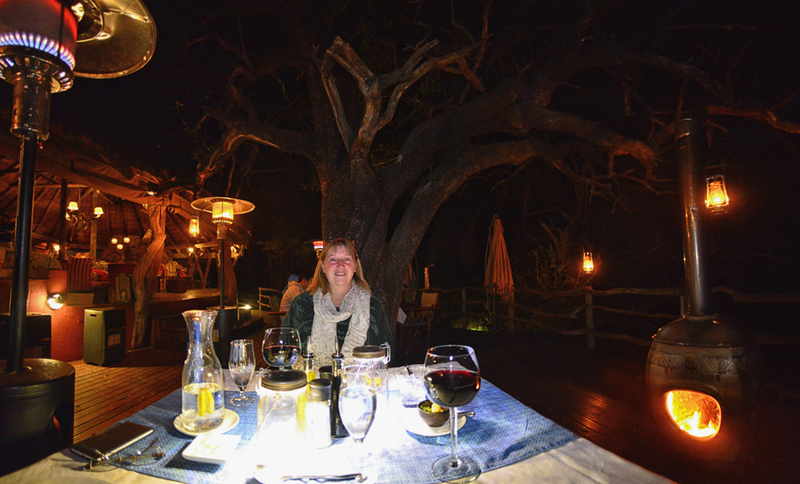 Safari Dining - we've had enough of these outsourced Kruger restaurants! We now mostly take all our own food and have rusks or bacon and eggs for breakfasts, sandwiches or hamburgers for lunch and a braai for dinners - all prepared at our bungalow. This is normally accompanied with beetroot, baked potatoes, asparagus or chili beans. 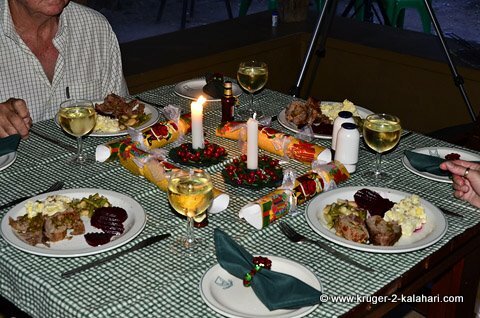 Safari dining at your cottage need not be a bland affair - you can set the table, light candles and have wine on tap! An added bonus of safari dining at our bungalow is that our photography does not stop - we photograph star-trails, and nocturnal animals,. such as the elusive eleven, in the camps and, if staying at Lower Sabie or Skukuza, we photograph the river action in front of our tent or bungalow while drinking sundowners or cooking dinner! On some nights our nocturnal photography is more exciting than our daytime photography! Safari dining at the private lodges in Sabi Sands and the Kruger concessions generally is very good. We have eaten at Lukimbi, Idube, Inyati and Ulusaba and we have had tender, tasty food but also the odd chewy kudu kebabs (at Inyati) as an example. The service was, however, always 5-star at all these lodges. The private lodges charge anything from R2000,00 per person per night at affordable lodges to R25 000 pppn at high-end lodges. The above prices include all meals and if you are paying over USD 1500,00 per person per night you would expect 5-star safari dining every day at every meal without fail! The Kruger National Park is the the crown jewel of South African National Parks - if only they could get their safari dining experience to be part of the crown. •	"We drove on to Lower Sabie for a beer and the most disgusting toasted chicken mayo sarmie I have ever eaten in the tackiest cafeteria I have seen in decades"
• "To compound our disapointment at Satara we had a dreadful meal, with pathetic service (waiter even forgot to place our order) in the restaurant. Lunch next day proved to be as bad, they didn't know if they were in the restaurant or the fast food section - poor quality and high prices. We met other overseas visitors that night in a nearby bungalow who had also received bad treatment and as a result had decided to leave the park the next day with a poor opinion of South African hospitality." • My mother always told me you never complain about food, and I never have, but if I spend R200 on a breakfast every day it best have golden eggs and diamond bacon bits.. not the disgusting food that they serve there.. Whomever is in charge of the restaurant at Lower Sabie needs to catch a wake up and check the quality of the food they serve people. Some examples: Cold coffee, eggs fried in very old oil which makes anything taste like rubber, raw mushrooms posing as grilled mushrooms.. very bad service from the waiters (not going to even go here), Ham on omelette that tasted very off..."
•	"Why can’t Kruger get it right when it comes to catering? Imagine if they outsourced their restaurants to a company with a proven track record in South Africa of actually running family type restaurants at a reasonable price – how good will that be. 'So folks, where shall we eat tonight? Spur or Nandos?' At the moment it is dry, overcooked chicken or pork and very overcooked vegetables, with some tired salads as a distraction. Maybe one does not go to the Kruger Park for their culinary offerings but for their wildlife experience? Why can’t it be both? 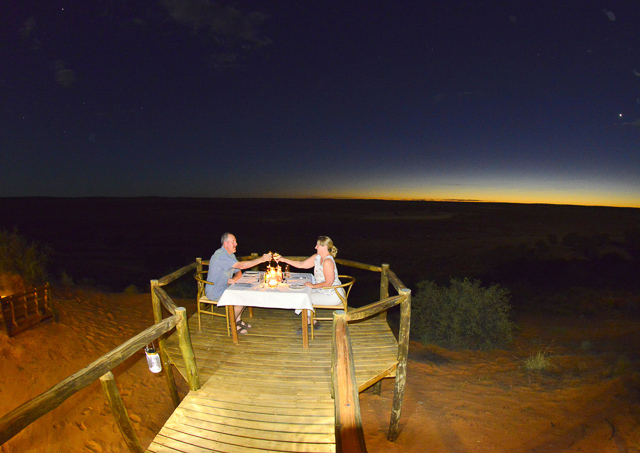 Out of the three main camps in the Kgalagadi only Twee Rivieren has a restaurant. There is no view but it has a lovely feel to it with some great wildlife pictures on the walls. The food and service are NOT good! We last ate here in 2006 and we were not impressed but decided, in March 2010, to give them another try – big mistake! We both ordered fillet steak...well I can tell you we did not get fillet steak, I could not even cut it never mind chew and swallow it! When we complained nothing was done, the waitress then took our plates still with most of the fillet on it and did not say another word she just brought us the bill, we paid over R100.00 for each of our ‘fillet’ steaks). 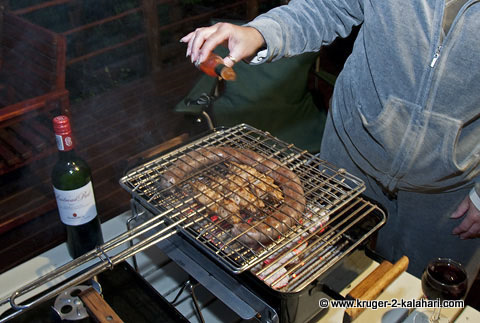 We will not be caught again - we will only be braaing at Twee Rivieren camp! Etosha's safari dining is good. All three main camps have restaurants that were refurbished in 2008. The restaurants at Namutoni and Okaukuejo both look much better than they did and the food tends to be good. The restaurant at Halali is not an improvement over the old one. It no longer has the chalk drawings of animals on the walls and the atmosphere is cold and uninviting. The food at Halali used to be 5-star but since the German chef has retired we now rate the food 3 or 4-star in terms of choice and taste. We still eat at the restaurants but alternate between braaing at out chalet (if the chalet has braai facilities) or we take our food to the waterholes. 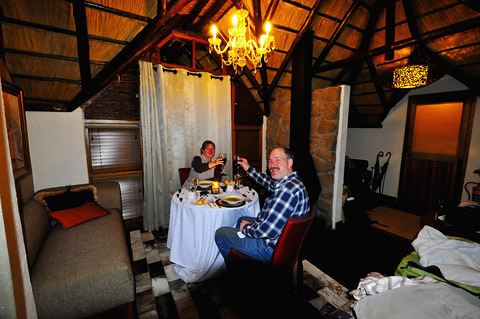 Safari dining in the Pilanesberg restaurants is generally good. Manyane offers restaurant facilities that can do both A La Carte and buffet meals daily and a regular Sunday lunch buffet. The food at Bakgatla restaurant is usually good. The buffet breakfast is included in the price and the choice and quantity of food is always great. The ambiance, however, is not good - the restaurant was renovated in 2012 but the decor is horrible! Kwa Maritane has a lovely restaurant that looks onto the park and has an eating area under thatch overlooking the swimming pool with palm trees all around the pool. The food and service were excellent. 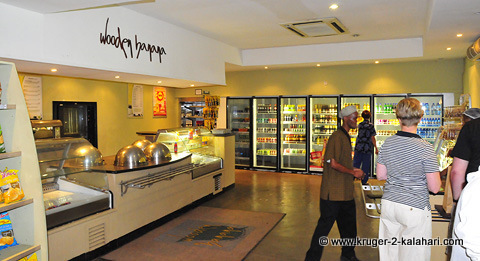 They have a breakfast and evening buffets or you can choose an a la carte lunch. Bakubung Lodge has a nice restaurant with tables inside and outside, all overlooking a waterhole. We have eaten lunch and dinner there and the food was good but service was slow. 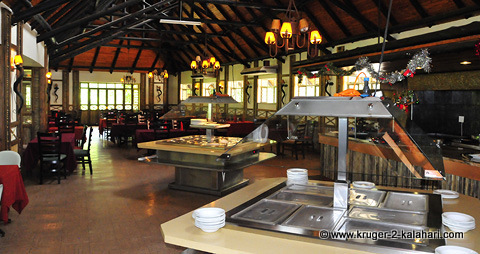 At Ivory Tree and Shepherd's Tree Lodges all your meals are served in the main dining rooms. The food and service were very good and the staff members that we encountered were helpful and friendly. 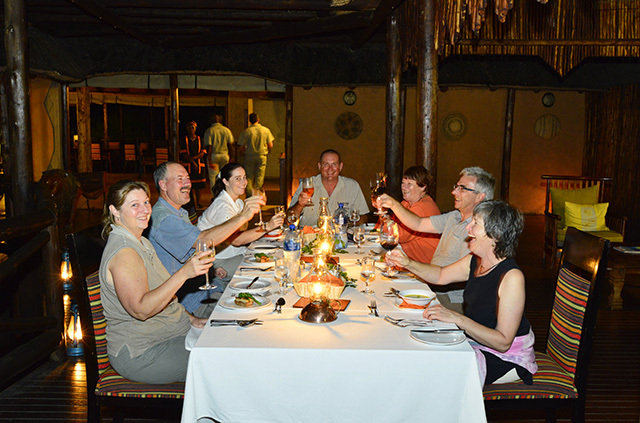 The restaurant at Tshukudu Lodge has international cuisine with an African influence and wonderful South African wines. Seating is around a large dining table or outside on a covered deck overlooking the waterhole. Brunch, high tea, and 5-course dinners are served daily. Pilanesberg private Lodge serves good wholesome meals either in the diningroom, on the pool deck or on the patio looking onto the waterhole. The food at the 12 Madikwe lodges that we stayed at was all good - breakfasts, lunches, high teas and dinners are generally delicious. The only difference between lodges is that some chefs are more creative and imaginative than others. We believe that if we get above average service we should tell the owner or manager and by the same token if we get poor service we should do the same otherwise how will the establishment improve? SANParks use their forum to get a feel for good and bad service. Visitors post their experience and the moderators feed this back to the relevant people within SANParks. When we complained about the food and service the majority of posts agreed with us so SANParks knows there is an issue with the restaurants but have they done anything about it? One person replied and said that we are expecting too much as we are 'in the bush'. If we get poor quality food and service we should just accept it and appreciate the wilderness instead! We work hard for our money and we would like value for it so we don't buy that one! The point is that we are being charged high prices for this food so therefore we want high service and quality. There is no excuse for the poor quality - the outsourced company is an international catering company and they should be ensuring quality food and training their staff better and monitoring the restaurants regularly. About 70 percent of visitors to the Kruger Park are South African residents yet the majority of the business in the restaurants comes from foreign guests and tour operators. Why so few locals - what do the locals know! Could it be a case of 'once bitten twice shy'?